It turns out the position of men’s basketball coach at Florida Gulf Coast University is a Fly-by-night job after all. 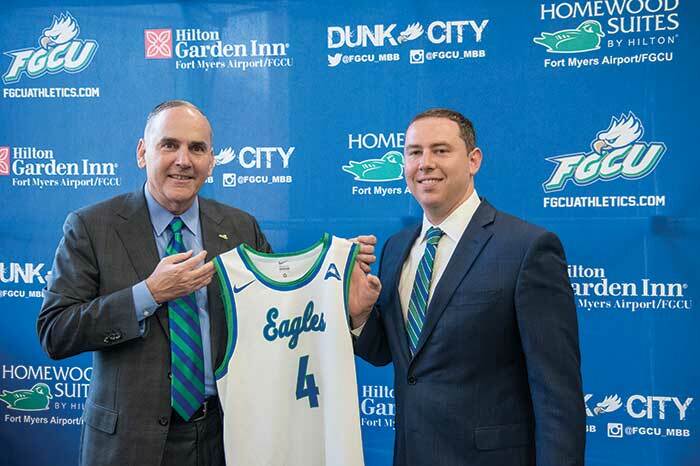 It only took the one night of April 4 for FGCU Athletics Director Ken Kavanagh to elevate Mike Fly, an Eagles assistant for seven seasons and one of the founding architects of Dunk City, to the top job after five-year Coach Joe Dooley took his 114 wins, a string of ASUN Conference titles and two NCAA berths back home — “home” being East Carolina, where he had enjoyed some success in his first head college job from 1995-99 before he got swept out in an athletic-director upheaval. A contract that with incentives gives the ASUN Coach of the Year a salary boost from the $350,000-per-season he was paid at FGCU to a progressive five-year deal at ECU that elevates from $900,000 to $1 million a year — along with the bonus that his parents live near Greenville, N.C. — easily made Dooley’s old “home” where his heart is again. FGCU Athletics Director Ken Kavanagh quickly promoted Fly to be the fourth head coach in program history. In reality, coaching jobs at FGCU are hardly fly-by-night. At the April 5 press conference to announce Fly’s promotion, both Kavanagh and Fly were quick to salute the founding coaches who’ve been soaring with the Eagles since day one of their respective programs: the Daves of the diamond — Tollett in baseball, Deiros in softball — women’s soccer Coach Jim Blankenship, and the hands-down greatest FGCU coach who has ever blown a whistle, recruited a student and her or his family, drawn up a game plan, hired a staff, inspired a player, cracked down on academics, engaged a community and dominated a conference: Karl Smesko, the university’s women’s basketball coach. But more later on Smesko and the usual 20-plus wins, conference championship, coach of the year honor and postseason success he breezed through in 2017-18. Smesko’s achievements — numerous and impressive as they may be — are just more of the same. Rather, the Eagle eye is on new guy Fly, who becomes the fourth head coach of the men’s basketball program, but the first to branch off the Eagle coaching tree. He was brought to FGCU by former Eagles head coach and Dunk City creator Andy Enfield from the staff of Leonard Hamilton at Florida State in 2011, when Seminoles assistant Enfield got the FGCU job. But when Enfield quickly cashed in his Dunk City jackpot of a Cinderella Sweet 16 appearance after his second season, 2012-13, by jumping at the University of Southern California job, Fly stayed grounded, becoming part of Dooley’s staff. That loyalty paid off for new head coach Fly in a three-year deal with a starting annual base salary of $225,000 — the same as Dooley’s first contract. As the last remaining member of the 2012-13 team, Fly will always embrace the program-changing season. But he sees Dunk City as just an important first stop on the new flight he’s charted at FGCU, and he knows where he wants the destination to be. “What I want this to become — and what I think this can become — is Southwest Florida’s team,” said the 35-year-old Fly, a true boy of the bluegrass born in Fulton, Ky., who graduated from the University of Kentucky in 2006 with a bachelor’s degree in education. “By that I mean I don’t want this to be something that people look at and remember as that one time in 2013 when, ‘Man, that was lob city.’ If I do my job like I plan to do it, I think this will become Southwest Florida’s team — that’s what we want, and that’s what we need. I want the feeling of 2013 to be there every time that we open those doors, that you’ve got to be there and you’ve got to see it. Billed as a talented recruiter who was key to signing many of the players who helped create what has become the ASUN’s most consistent men’s program, Fly personally recruited four of the five newcomers he’ll welcome to his first FGCU team in 2018-19. Barring defections, he’ll welcome back as many as 14 players from last year’s 23-12 group that won the ASUN regular-season title, then lost 108-96 to Lipscomb in a wild ASUN Tournament championship game in which the Eagles almost overcame a 32-point second-half deficit, which would’ve been an NCAA record for the greatest comeback ever. The season ended in the National Invitation Tournament, where the Eagles fell 80-68 in round one at Oklahoma State — which ironically had been reported before the season to have hired Fly away from the FGCU staff as a new Cowboys assistant, only to see Fly decide to remain with the Eagles. It’s a small basketball world, after all. Fly’s most decorated returning Eagle is expected to be one of those guys he recruited, first-team All-ASUN selection Zach Johnson and his 15 points per game from 2017-18 — unless Johnson’s declaration for the 2018 NBA Draft turns out in the rising senior’s favor and he’s off to the pros. Another player Fly is credited with bringing to FGCU as a transfer from Central Florida, just-departed Brandon Goodwin, won’t get to play for the guy he considered “almost as a head coach these past few years, even though he was an assistant” and who “really wants to see guys succeed.” Goodwin loves the “tremendous pick” — words that carry weight from a player who, despite just two years with the Eagles, joined Sherwood Brown (2013) this season as the second player in FGCU history to earn both All-American and ASUN Player of the Year honors. With that statement, the most decorated men’s basketball player in Eagle history could also have been talking about the most decorated coach in university history — the guy in the other basketball locker room who founded the women’s program. For when it comes to coaches who have established a standard, few have done so to the level of Karl Smesko. Karl Smesko has been at the center of 435 wins in 16 seasons at FGCU after founding the women’s program. The 2017-18 season was perhaps Smesko’s best so far: 31-5 overall record, ASUN regular-season and tournament championships, an 80-70 upset of No. 5 seed Missouri by his 12th-seeded Eagles in the Stanford Regional of the NCAA Tournament, and a No. 25 ranking in the final USA TODAY Coaches Poll after the season ended with a loss to No. 4 Stanford on its home floor in round two of the NCAA. And Smesko took home his eighth ASUN Coach of the Year honor, in case he still has room to put those darn plaques somewhere. So why doesn’t Smesko do what most wildly successful coaches (such as Enfield and Dooley) do and leave for a bigger school, more money and a shot at greater prestige? During a question-and-answer segment in the Coach’s Chair at Women’s Hoops World in February, Smesko, who last year said “No thanks” to the USC program to which Enfield said “Yes, I’m on my way” a few years earlier, laid it out simply. This kind of success doesn’t come by accident. Call it Karl Kulture. The man came with a plan when he took the FGCU job in 2001, and the formula has resulted in 435 wins with the Eagles over 16 seasons, including an even 300 since FGCU elevated to Division I status. For the record, Smesko’s incredible cumulative record as a head coach leaves him just four wins shy of 500 for his career, and at age 47, who knows how high he’ll navigate that number? The record surely will be boosted next season, when the Eagles return three of their top seven scorers, four NCAA Division I transfers will be eligible and three first-year signees join Karl’s Klub. So how does this native of Bath Township, Ohio — a graduate of Kent State University (bachelor’s in journalism) and Walsh College (master’s in education) — keep the standard the standard? 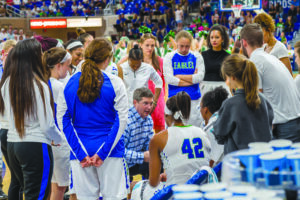 It starts with an All-FGCU coaching staff; every assistant who has anything to do with FGCU women’s basketball is a product of the Karl Kombine. Associate head coach Chelsea Banbury and Amanda Pierce, director of basketball operations, were early FGCU teammates, as were assistant coach Jenna Cobb and video coordinator Stephanie Haas on a later edition of the Eagles. Chelsea Lyles is another former FGCU player, and as Smesko’s recruiting coordinator, she’s the assistant coach most responsible for ensuring that the talent pool stays deep. Zderadicka (7.6 points per game) is one of the key returnees for Smesko, along with Nasrin Ulel (9.5 ppg) and Tytionia Adderly (7 ppg and a team-leading 8.9 rebounds per game), who was second-team All-ASUN. They will help offset the losses of the team’s leading scorers, Rosemarie Julien and China Dow, who were first-team All-ASUN; and Taylor Gradinjan, who took advantage of two seasons shortened by knee injuries and the ensuing redshirts to earn two degrees at FGCU (bachelor’s in exercise science; master’s in health science) while making the ASUN All-Academic Team and sparking the greatest 3-point-shooting team in NCAA history (a record 431 made in 2017-18) by hitting 89 shots behind the arc this season. You aren’t the only one, Taylor. it seems like everyone wants to fly like an Eagle these days. Even a guy named Fly.